There's no secret to balance. You just have to feel the waves. Murbella senses the time between recognizing Duncan’s plan and the shaking of Central from the no-ship lift-off as an eternity. Bell is there with her, she tells Murbella that Sheeana took the Van Gogh for her room in the ship. Odrade’s persona asks if Murbella can see what they’re planning, the Missionaria scheme and more. It’s the next phase: Muad'Dib to Tyrant to Honored Matres to Bene Gesserit to Sheeana. It will be bitter medicine but the survivors may create interesting patterns. Meh, I never understood what exactly this "next phase" is all about. Sure, it may involve making Sheeana into a holy figure etc, but "Muad'Dib to Tyrant to Honored Matres to Bene Gesserit to Sheeana"? orald wrote: Meh, I never understood what exactly this "next phase" is all about. Muad'Dib had his Jihad, Leto II gave them stagnation and then cast them out in a scattering, the Honored Matre has brought the empire to its Knees, the Bene Gesserit have taken control of the Honored Matre and now its Sheeana's turn to shape the universe. I think this is the Golden path in its most basic form. Leto's plan to make the universe an ever changing form not a stagnent empire fixed and focused on one item the spice. Freakzilla wrote: There's no secret to balance. You just have to feel the waves. Sheeana takes the Van Gogh: she wants to hold a fragment of mankind, because she is going to merge with Sandtrout, and she no longer will be human, she will become another Leto II, pages earlier she considers doing it. Why?, well the Missionaria was creating this Holy Sheeana religion around her. "Can't you see what she intends? Oh, more than that. It's the next phase: Muad'Dib to Tyrant to Honored Matres to us to Sheeana . . . to what? Can't you see it? The thing is right there at the lip of your thoughts. Accept it as you would swallow a bitter drink. See it? The bitter medicine of a Sheeana future? We once thought all medicines had to be bitter or they were not effective. No healing power in the sweet." The Golden Path goes on, now guided by Sheeana. Maybe this is what Leto was talking about when he said he would die 4 deaths with the promise of resurection? If Sheenna takes on the sandtrout skin, would she be able to access that tiny pearl of awareness of the God Emperor in each worm? Would she have access to all his OM? I knew the females cannot look into the male memories because they would get possesed but would Leto keep them at bay and act through her or give her suggestions? Would she see his Golden Path and continue the work? Laphtiya wrote: Maybe this is what Leto was talking about when he said he would die 4 deaths with the promise of resurection? The only advantage I can see in doing this would be that the return of the God Emperor would result in another uprising on the scale of the Butlarian Jiahd. There is no one in the Imperium who does not know the name Leto II. And if he returned in the form of Sheeana, the people might follow him thinking that he could be no worse than the Honored Matres. Location: Rhode Island. Lithuania in the summer. Yeah, Laphtiya, has a point. 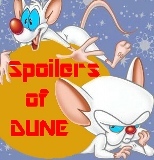 Many people were predicting before Dune 7 that Sheeana would take on the sandtrout skin, and maybe Dune 7 would be less about the Enemy of Many Faces as in Hunters and Sandworms, and more about Sheeana. This is certainly what that quote implies (from Muad'Dib to Tyrant to HM to BG to Sheeana). It's not "to Enemy" or to "Duncan" though it could easily have been if FH had written the novel, I don't know. My final opinion is that Sheeana would NOT take the trout skin simply because Leto already did it before. As I said before, though, I think she definitely would've conitnued the GP. If I ever stopped writing, my head would explode. The way I see it, the Golden path cannot be stopped but just pointed in the right direction. Leto did see ends to the path and he needed to make it last forever. Perhaps Sheeana taking on the Skin would continue the path in its next phase. Like I said before people might side with a God Emperor/Emperess over the Honored Matres. I mean the golden path was all about change, maybe Leto saw that the Bene Gesserit and Honored Matres would be just as stagnant as the old empire. And planned for Sheeana to take on the skin to shake things up again. And as a Bene Gesserit she could access the Pearl of awareness via Shared Memory and she would then understand what his plans were and able to continue them. But these people were all invisible to Leto's prescience, he could not have predicted that. Freakzilla wrote: But these people were all invisible to Leto's prescience, he could not have predicted that. The people were invisible yes, but not buildings and planets. Remember when they thought about using a nofield to hide Chapterhouse but the energy demends were too great? Leto could have seen the effects and changes in the environments and made an educated guess. However he could look down a future where he did not make people invisible and see the effects of that future. Just because he couldn't see people does not mean he couldn't make it so some one would take up his legacy. How would he know a Bene Gesserit would find his horde of spice and leave a message for them? Perhaps Leto COULD see them just as Teg can see the noships, but made it so no one else could thus giving an advantage to himself and whoever took up the sandtrout skin as he did. Ahp. If he could see Siona's footprints but not the woman what made them, he could have seen buildings. He would have had too. Aside from prescience, he was the son of a "super-mentat". I chose to believe what we're told through Leto's character, and one of those things is that he didn't look past his own time except a few glimpses to ensure the Golden Path endured. One member has suggested that only a Bene Gesserit could have found the clues to locate his spice hoard through Other Memory. Leto, being intimate with that OM could easily have planned that without prescience. That's what I thought - Leto made an educated guess based on what it would take to find that stash and then left the message there based on that guess more than prescience per-say. Again, he could have peeked at the spice hoard a few times and noticed when it disappeared. If he cared that much, that is. I forgot that he said he never used Prescience to see beyond his time, only glimpses to see that the GP continued. However one of these glimpses could have been to see if some one else had taken on the Sandtrout skin as he has done in order to continue the path. Sheeana's myth was already built, "the saint that controls the worms was killed on Rakis and ressurected", there's no need for her to take the sandtrout skin, Leto only did that to begin the workings of his vision of the golden path. In that part in Chapter House where she thinks about merging with the sandtrout like Leto did, she is only musing about it, she isnt seriously considering it. Frank had envisioned something alright but we would only find out about it in his sequel, he kept us on the edge like he always did. Seraphan wrote: Sheeana's myth was already built, "the saint that controls the worms was killed on Rakis and ressurected", there's no need for her to take the sandtrout skin, Leto only did that to begin the workings of his vision of the golden path. I wouldn't say that there is no need for it. The fact that she was considering it means that there is a possible need for it. It is true that no matter what we saw we will never know. But there are hints all around in Chapter House. I wouldn't rule it out completely, but I myself don't think it is 100% that is what it would've been. Perhaps Sheeana was simply going to free the people from Bene Gesserit manipulation, just as Leto freed them from the spice (some what) by scattering the empire. The importan thing we need to consider is why did she take a worm? Was it just to start the cycle on another world? But they knew Chapter House would have been found eventually so the same rule applies if they settle else where. Perhaps it was simply for the Sandtrout. why did she take a worm? Was it just to start the cycle on another world? But they knew Chapter House would have been found eventually so the same rule applies if they settle else where. Perhaps it was simply for the Sandtrout. And for what reason do we preserve it? So i can fill my mind with it now? Forgetting for the moment what i may confront tomorrow? Fill it with innocent stars. A pace apart Orion stands. Sheeana felt abruptly that she had won a chance to become the ultimate artist, filled to overflowing and presented with a blank surface where she might create as she wished. Odrade's words from those first childhood exposures to Bene Gesserit purpose came back to her. "Why did we fasten on to you, Sheeana? It's really simple. We recognized in you a thing we had long awaited. You arrived and we saw it happen." "It?" How naive I was! "Something new lifting over the horizon." My migration will seek the new. But...I must find a planet with moons. Of course, she took a worm to start the spice cycle on another planet. Freakzilla wrote: Of course, she took a worm to start the spice cycle on another planet. Bingo! To create another Dune.